and the ‘real world’ is blurred. i’ll give in – just once! the ‘real world’ that’s insane. Magic Refresh was my first panel of the con, so I was very excited to get it underway. The four panelists were Beth Cato, Brian McClellan, Greg van Eekhout, and Stephen Blackmoor. If you do something one thousand times and the results are always the same, that magic functions like a science. If you can’t then there is a freedom from predictable results that gives a lot of latitude to the author. When I got home, I looked up Chiang and found a very informative, interview-type blog on science versus magic, featuring Chiang and a few other authors that is definitely worth a read: http://io9.com/5021701/science-versus-magic–is-there-a-difference-in-the-world-of-fiction. The other authors also agreed that magic has to have a cost. Just as heroin has an addictive nature, magic has to have a physical or emotional sacrifice to the characters or to the world. That cost largely depends on what metaphor you pick for magic. If you pick money, it becomes a limited resource. If you pick love, it has an emotional cost. I found it interesting that all of the authors know where the magic in their worlds comes from, even if the characters and readers don’t. In fact, they said it was better only to give the reader what they need to know and that the best types of magic are the ones where you see the magic at work without necessarily having an explanation. 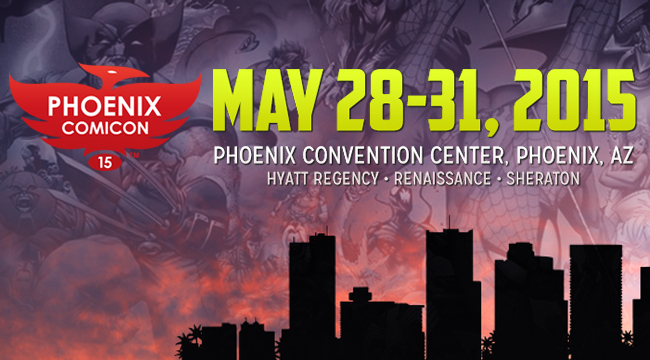 Six Days Until Phoenix Comicon 2015! I’ve finished my Conquest for Phoenix Comicon! I’m impatiently counting down the next six days, along with my husband and all the other Comicon fans in Phoenix. And of course, I can’t wait to attend the Steampunk Homecoming Ball benefiting Kids Need to Read, Evening Erotica with Gini Koch, and take a photo with Karl Urban! To me, Comicon really feels like Christmas for adults. It’s a time to let our inner children come out and play. We can dress up, play with props, take crazy photos, pursue our wacky sci-fi hobbies, and meet other like-minded people who don’t think that questions about efficient steam propulsion are strange. There are a million ways to enjoy yourself if you are a science fiction fan – and let’s face it, if you are reading this blog, you are a science fiction fan. Whether you attend classes, watch spectator sports like jousting or light saber battles, go to the auditorium to see the spotlights on famous actors or artists, or just come along to be part of the fun, I would encourage you to take at least one day to attend your local Comicon each year. As I writer, sometimes I tend to see romance where it doesn’t overtly exist. This song is one of those that I will use to put me in the mood to read or write dark romance for many reasons, the lycis, the beauty of the video, and the themes it evokes, to name a few. The story told in the video brought tears to my eyes the first time I saw it. A beautiful angel, played by Gabriel Nunez, does parkour across Cincinnati to save a young mother and her child from being hit by a truck at a streetlight. The video is wonderfully shot, using buildings, an angelic fountain, and a skywalk as the background for the stunts. The idea that a guardian angel is watching out for us, that they would go to extraordinary lengths to protect us from harm, is very close to several themes that philosophers have struggled with as long as philosophy has existed. Where do we come from? Are we alone? Is there anyone out there who watches over us? It isn’t hard for me to bring romance into this scenario. In my mind, the woman is a single mother, and the angel is her protector. He fell in love with her, but was busy being lectured by another angel until the last minute, when he realized she was in danger. Normally, he would have interfered to move the truck out of the way, or urge her into a different route, but because of the lack of time, he was forced to simply run in front of her car, showing himself. You know where this story is going to go next, don’t you, lover of dark romance? Yes, this is the beginning of a wonderful story where the angel is going to sacrifice his wings to live a human life, and she has to come to terms with feeling worthy of that sacrifice, just by being herself. And no, she isn’t going to be hit by a car the next day for all of you naysayers. 😉 They are going to live happily ever after. 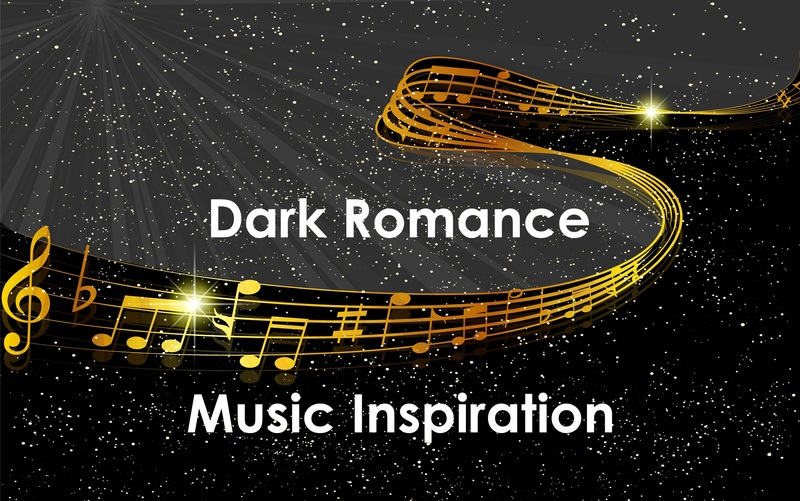 Today’s song is not a romance ballad…but I think if you look you will see that it is the inspiration for a lot of writers. This song, Wrong Side of Heaven, by Five Finger Death Punch, is intended to show to the plight of the veterans who have returned home with issues but aren’t receiving help. Why do writers write? I suspect that it’s probably for the same reason that singers sing, and today I am going to share with you another way that songs can inspire me to write – that is, by bringing up an issue or problem that needs to be solved. What does Phoenix Comicon offer authors? Well, it’s almost that time of year again. Comicon!!! Last night I presented a table talk at Desert Rose on why authors should attend Phoenix Comicon, and I thought I’d share a few key points with you. The largest reason to attend comicon is to get new ideas. Most authors attend plenty of ‘author’ workshops – by authors, for authors. Comicon is place where you can attend workshops intended for a larger audience, allowing you to take ideas from other genres or media to diversify your writing. Let me give one great example of this. I taught two comic classes for four years when I was in Korea. I used two books by Scott McCloud, Making Comics for the first semester, and Understanding Comics for the second semester. 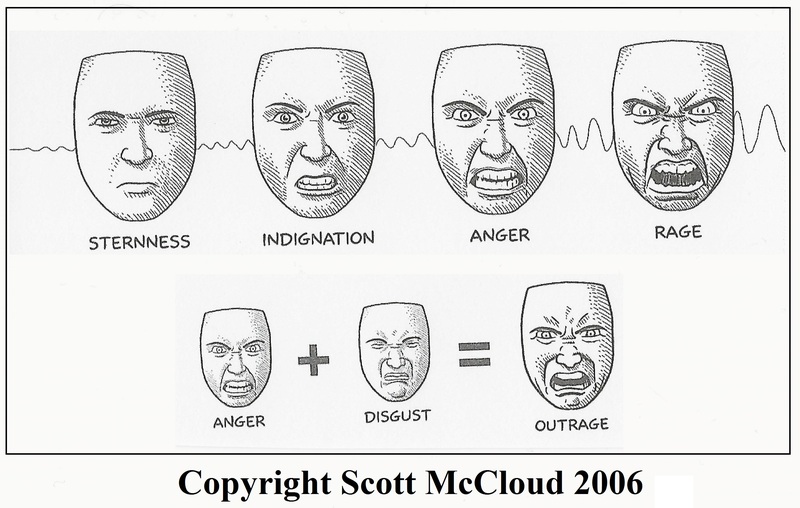 In Making Comics, McCloud does a wonderful job of covering the six facial expressions that are present in every culture on the planet, how facial expressions scale (sternness > indignation > anger > rage), and how facial expressions mix to create new expressions (anger + disgust = outrage). Is this useful for an author? That question was entirely rhetorical. The ability to describe facial expressions in unique and interesting ways is one of the hallmarks of a great writer. Attending a course for artists on how to refine facial expressions will teach you a lot about how to break them down so you can visualize and describe them in your work. This is only one, infinitesimally small portion of what Phoenix Comicon offers. You can attend makeup and costuming classes to bring life and detail to your characters. You can walk through the vendor shops and observe what people are buying. What appeals to the market? What is trending? What age groups are buying certain items, and what classes are they attending? And hell, if you have no imagination, I guess you can just attend one of the around 100 courses offered for authors. Many of the writing courses can be applied to any genre: Reluctant Heroes, Who’s driving? Plot or Character?, How Evil Should They Be? Villains and Anti-heroes, and Get to Know Your Firearms are just some of the many offerings that can be applied across genres to make your writing better. Here is a preliminary list of what this year’s comicon schedule is going to look like. There are already more classes up on the site, and if it is like last year, I believe that this list shows only about half the courses that will be offered. The rest aren’t up on the web site yet because they are late with the scheduling. At $80, you aren’t going to find better value for money anywhere else. The official web site is here: http://www.phoenixcomicon.com/. Good = Perfect – when do we need flaws in our protagonists? Have Your Writing Critiqued – The First Page – Can You Make the Cut? How Big Can It Get? – building massive worlds, creating huge casts of characters, etc. Outside Influences – Be it peer pressure or possession, how do outside influences get in and change a character? Paranormal Romances – Can love survive? Who’s Driving? – Plot or character? Writer’s Life – How to: maintain a “normal” life, handle writing time, budget irregular paychecks, deal with travel, and fans. How can family handle this? Hear from authors and their significant others on how to survive the literary life. Last week, I mentioned that I often use music to get myself ‘into the mood’ for writing. 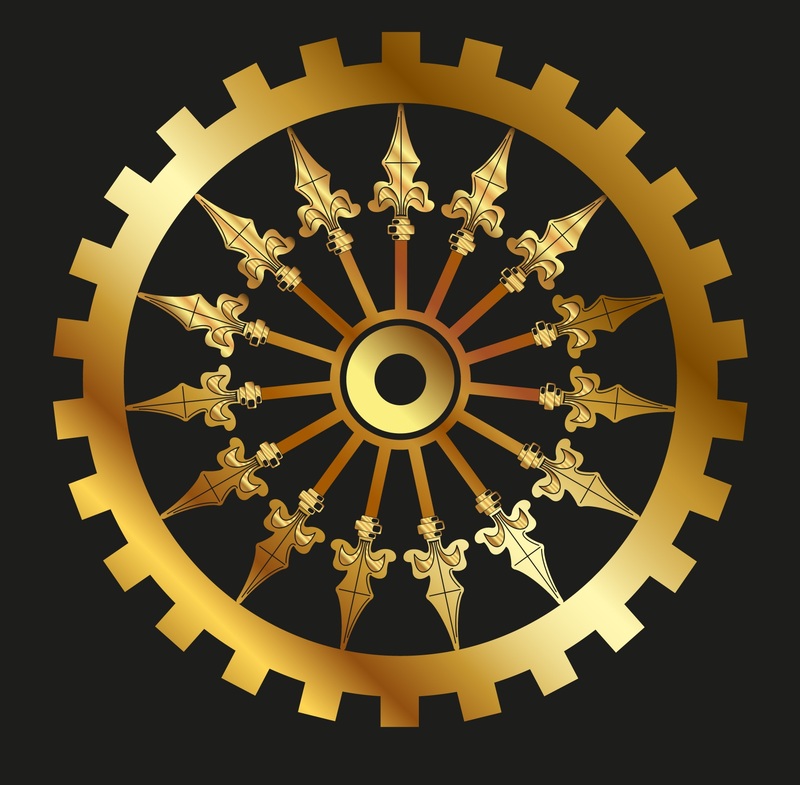 One of the songs I used for my soon-to-be-released steampunk series is Beautiful, by Pop Evil. This song is special to me because it communicates strongly and clearly that beauty is in the eye of the beholder, and that each of us is beautiful to someone. It really fit the series, because my hero, Cyrus, has bionic legs and a bionic eye from being involved in a mine explosion, and my heroine has been through her own battles working underground in a mine for five years. Neither of them feel beautiful, but each of them is beautiful to the other, and eventually comes to see that beauty in themselves. Creating this type of feeling before writing is very important to me, because I want my characters to be beautiful despite their flaws, or perhaps because of their flaws. . I can only hope that my characters inspire the feelings of love and self-acceptance in the reader that this song inspired in me when I was writing. And this idea doesn’t have to be relegated to the realm of fiction. I think it is important to remember that YOU are beautiful, flaws and all. In fact, your flaws are probably your greatest undiscovered assets. They make you unique, they give you obstacles, and they imbue you with character.